This is a fun and messy Valentine project for your kiddos. (I have proof too!) You do not have to do it exactly as I have, if yer kiddo is too young for the straw painting or you do not have liquid water or food color, use crayons or markers for the trunk instead. Enjoy! Set up your work area. If you do not have a splat mat you can improvise with a long sheet of wax paper and/or a cookie sheet. Begin with a sheet of paper, any size you wish to use. Fold it in half and tape down inside portion to work surface. I used masking tape which will tear your art a wee bit, painters tape is a much better option though not as pretty. 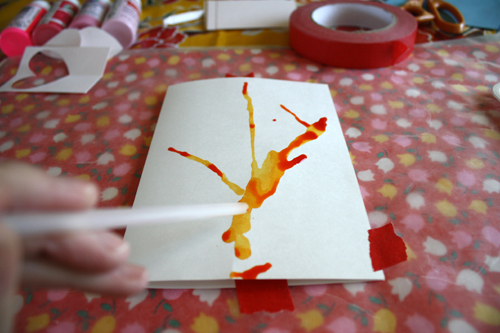 Drop a few drops of the liquid paint close to the bottom of your paper and in the center. 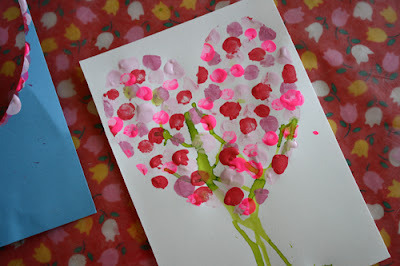 You can also use watered down tempera or acrylic for this. The easiest way to drop your drops is to have your wee one place the straw in the paint while their finger is over the top part of the straw. With the clean end of the straw, have your kiddo gently blow on the drops to "guide" them to for ma tree shape. 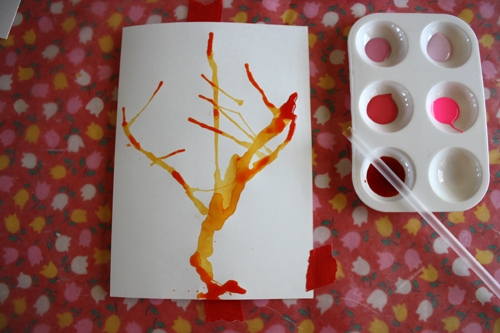 This isn't as easy as it may seem so if you and/or your wee one gets discouraged, blow a little then use the paint end of the straw to "paint" the tree trunk. Sometimes serendipity strikes and you get an awesome tree right away, other times, not so much. If you find there are big puddles of paint, use a paper towel, rag or napkin to gently blot the paint up. Set aside to dry. If you do not have the paint for the trunk, use a marker or crayon instead. Take another sheet of paper, the same size or smaller than your first. 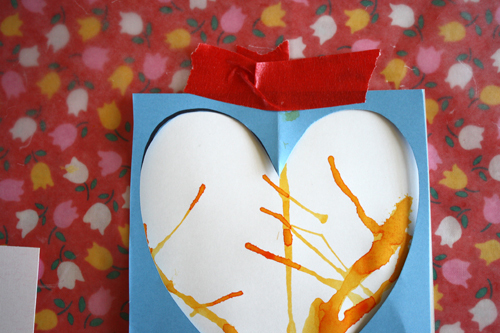 Fold in half and either draw a half hear shape from the top down or have your kiddo do it. Allow your kiddo to cut it out if she or he is scissors ready.Open up cut folded piece and arrange it atop your trunk picture once that has dried. The heart will be the body of the leaves. Tape into place. 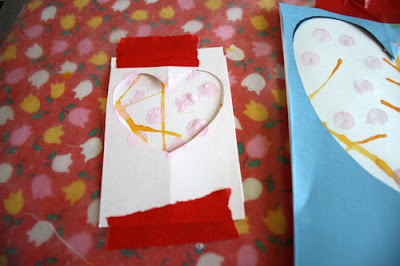 Set out leaf colors and have your kiddo fingerprint leaves within the heart stencil. use the lightest color first. You do not have to use all pink and reds, mix it up, have fun with it. Set aside to dry and begin on your next tree! You can make these trees as big or little as you like. The bigger the tree, the easier it is to create. However an index card will work as well as any folded sheet of paper. I would suggest you let yer kiddo paint the trunks first and then do the rest. It will allow the wet trunks a little more time to dry. If you have a tot who absolutely refuses to get dirty, use a q-tip or the eraser end of a pencil. If you feel inspired, carve a wee heart shape from a potato and use that. If you want to shy away from paint all together, draw up the trunks and use stickers or rubber stamps for the leaves. This can be as open ended as you want it to be, have fun and please feel free to ask me any questions! I can be found on Facebook and twitter. My gmail is jekinthebox or scrumdillydo and there is a flickr group for you to play along. Fridays we'll be featuring crafts and projects from the group. **the photo at the top is of a Valentine made by six year old Alaina, daughter to the super talented Tara Anderson of the pink couch who graciously jumped in to make one and took a pretty picture to boot! Thank you Tara! So pretty, Jessica! I love this idea. I can't wait to make these! 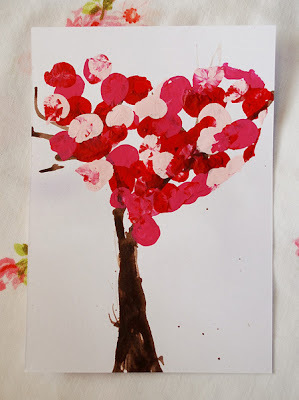 I've been wanting to do a straw blown tree with my son, and I love this tree version!! Can't wait! Thanks for the awesome craft. We made our version this morning as our snow day craft. Everything you make is pure magic!!!! !